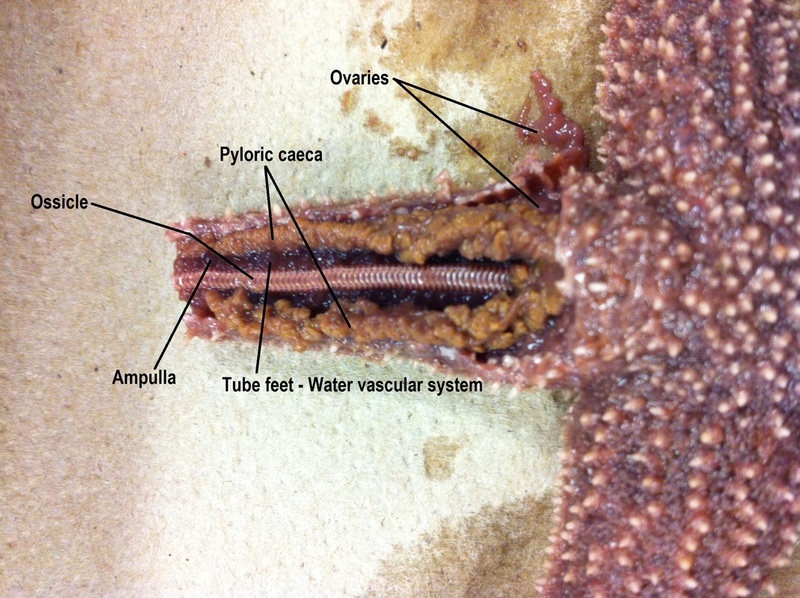 To investigate the internal and external structures of a sea star. 1. Obtain a preserved seastar and rinse off any preservative with water. 2. Place the seastar in the dissecting pan with its dorsal or aboral (top) surface upward. 4. Locate the central disc in the center of the seastar. Locate the small, round hard plate called the madreporite on top of the central disc. Water enters through this into the water vascular system. 5. Feel the upper surface of the seastar for spines. These spines protect the seastar and are part of their internal skeleton. 6. Look at the tip of each arm and find the eyespot. 1. Turn the seastar over to its ventral or oral surface (underside). 2. Locate the mouth in the center of the central disc. Find the ring of oral spines surrounding the mouth. 3. Find the groove that extends down the underside of each arm. This is called the ambulacral groove. 4. Feel the numerous, soft tube feet inside each groove. These are part of the water vascular system & aid in movement and feeding. 1. With the sea star's aboral side up, cut off the tip of a ray, then cut a strip off the top, exposing the inside. 2. Inside each arm, locate two long digestive glands called the pyloric caeca. These make enzymes to digest food in the stomach. 3. Cut a circular flap of skin from the central disc. (You will have to also cut around the madreporite in order to remove this flap.) Observe the stomach under the central disc. 4. Remove the pyloric caeca from the dissected ray. Find the gonads (testes or ovaries) underneath. These may be small if the seastar is NOT in breeding season. Remove these to see the rest of the water vascular system. 5. Cut off the tip of a ray to observe the parts of the tube feet. Find the zipper-like ridge that extends the length of the ray. The tube feet are attached to these. 6. Locate the bulb-like top of a tube foot called the ampulla. This sac works like the top of an eyedropper to create suction. The bottom of the tube foot is a sucker. 7. Embedded in the soft body wall are skeletal plates called ossicles. 8. Running down the center of each arm is a lateral canal to which tube feet are attached. 9. In the central disc, the five lateral canals connect to a central ring canal. 10. A short canal called the stone canal brings water into the ring canal via the madreporite. 1. Q: What type of symmetry did your seastar have? 2. Q: How many arms or rays does your seastar have? 3. 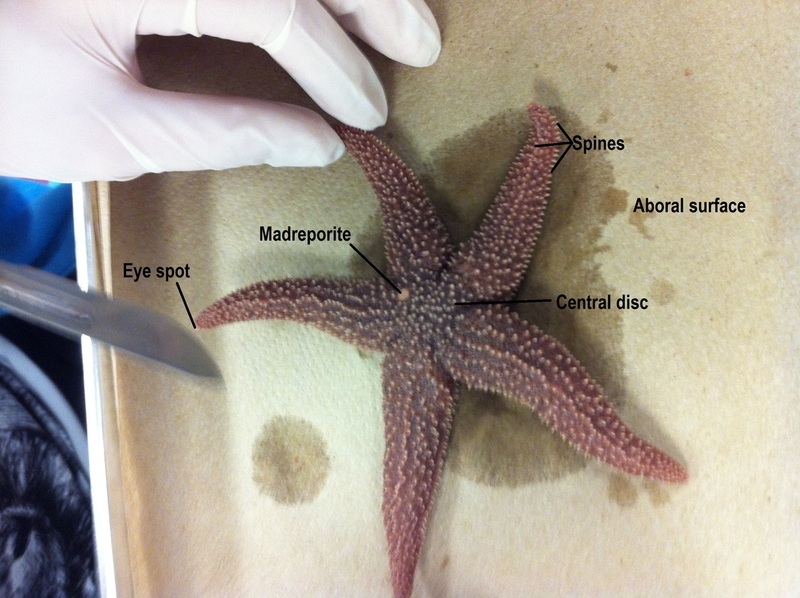 Q: Label the central disc, arms, spines, eyespot, and madreporite. 4. Q: What is the upper surface of the starfish called? 5. Q: What is the lower surface of the starfish called? 6. Q: Label the oral spines, mouth, ambulacral groove, and tube feet. 7. Q: Lable pyloric caeca, stomach, central disc, gonads, ampulla, and ossicles. 8. Q: Label the lateral canal, ring canal, stone canal, and madreporite. 9. Q: Trace the path that water takes when it enters and moves through the seastar. A: Water enters the seastars body through the madreporite. It travels through the stone canal into the ring canal. It then enters the five radial canals, which take the oxygen to various places around the body. It also goes in and out of the tube feet for gripping onto rocks, as well as for hunting. Deoxygenated and un-needed water are sent back to the ring canal, up the stone canal and out of the madreporite. 11. 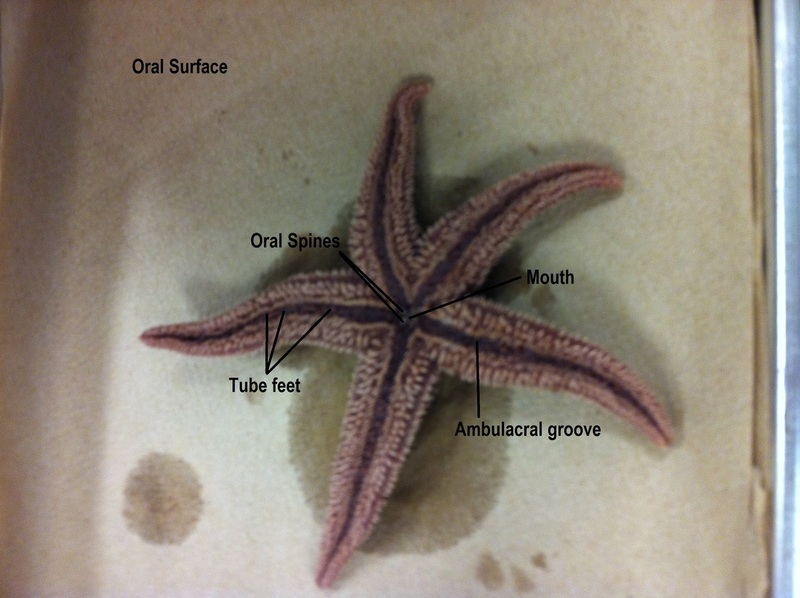 Q: What part of the tube foot creates suction to open clams whenever the seastar feeds? 12. Q: Why do the gonads sometimes appear larger? A: If the seastar was going through its reproductive phase at the time of death, then the gonads would be enlarged. 13. Q: What type of skeleton, endoskeleton or exoskeleton, does the seastar have? A: Seastars have a basic endoskeleton comprised of ossicle plates which surround the muscles. 14. Q: What bony plates make up its skeleton? 15. Q: What is the function of the pyloric caeca? 16. Q: Where is the stomach of a seastar located? 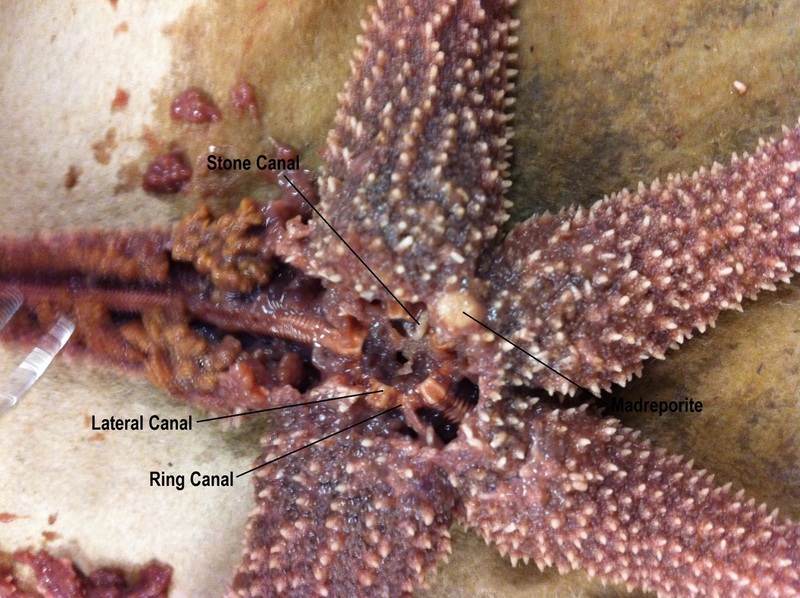 What can the seastar do with its stomach when feeding on clams and oysters? A: Both the pyloric and cardiac stomachs are located in the central disc of the sea star. To feed, the seastar wraps itself around the clam and opens the shell. It then inverts its cardiac stomach into the shell of the clam, releasing its digestive enzymes. This process turns the insides of the clam to liquid, which the starfishb then brings back into its body and into the pyloric stomach to be distributed throughout the body.